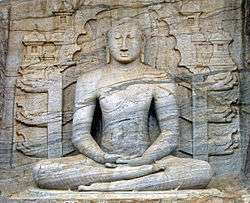 During the 5th to 13th centuries, Southeast Asian empires were influenced directly from India and followed Mahayana Buddhism. The Chinese pilgrim Yijing noted in his travels that in these areas, all major sects of Indian Buddhism flourished. Srivijaya to the south and the Khmer Empire to the north competed for influence and their art expressed the rich Mahāyāna pantheon of bodhisattvas. From the 9th to the 13th centuries, the Mahāyāna and Hindu Khmer Empire dominated much of the Southeast Asian peninsula. Under the Khmer Empire, more than 900 temples were built in Cambodia and in neighboring Thailand. After the decline of Buddhism in India, missions of Sinhalese monks gradually converted the Mon people and the Pyu city-states from Ari Buddhism to Theravāda and over the next two centuries also brought Theravāda Buddhism to the Bamar people, Thailand, Laos and Cambodia, where it supplanted previous forms of Buddhism. Theravada Buddhism was made the state religion only with the establishment of the Sukhothai Kingdom in the 13th century. The details of the history of Buddhism in Thailand from the 13th to the 19th century are obscure, in part because few historical records or religious texts survived the Burmese destruction of Ayutthaya, the capital city of the kingdom, in 1767. The anthropologist-historian S. J. Tambiah, however, has suggested a general pattern for that era, at least with respect to the relations between Buddhism and the sangha on the one hand and the king on the other hand. In Thailand, as in other Theravada Buddhist kingdoms, the king was in principle thought of as patron and protector of the religion (sasana) and the sangha, while sasana and the sangha were considered in turn the treasures of the polity and the signs of its legitimacy. Religion and polity, however, remained separate domains, and in ordinary times the organizational links between the sangha and the king were not close. Among the chief characteristics of Thai kingdoms and principalities in the centuries before 1800 were the tendency to expand and contract, problems of succession, and the changing scope of the king's authority. In effect, some Thai kings had greater power over larger territories, others less, and almost invariably a king who sought successfully to expand his power also exercised greater control over the sangha. That control was coupled with greater support and patronage of the ecclesiastical hierarchy. When a king was weak, however, protection and supervision of the sangha also weakened, and the sangha declined. This fluctuating pattern appears to have continued until the emergence of the Chakri Dynasty in the last quarter of the 18th century. Buddhist monk chants paritta to a group of Siamese women in 1900. By the 19th century, and especially with the coming to power in 1851 of King Mongkut, who had been a monk himself for twenty-seven years, the sangha, like the kingdom, became steadily more centralized and hierarchical in nature and its links to the state more institutionalized. As a monk, Mongkut was a distinguished scholar of Pali Buddhist scripture. Moreover, at that time the immigration of numbers of monks from Burma was introducing the more rigorous discipline characteristic of the Mon sangha. Influenced by the Mon and guided by his own understanding of the Tipitaka, Mongkut began a reform movement that later became the basis for the Dhammayuttika order of monks. Under the reform, all practices having no authority other than custom were to be abandoned, canonical regulations were to be followed not mechanically but in spirit, and acts intended to improve an individual's standing on the road to nirvana but having no social value were rejected. This more rigorous discipline was adopted in its entirety by only a small minority of monasteries and monks. The Mahanikaya order, perhaps somewhat influenced by Mongkut's reforms but with a less exacting discipline than the Dhammayuttika order, comprised about 95 percent of all monks in 1970 and probably about the same percentage in the late 1980s. In any case, Mongkut was in a position to regularize and tighten the relations between monarchy and sangha at a time when the monarchy was expanding its control over the country in general and developing the kind of bureaucracy necessary to such control. The administrative and sangha reforms that Mongkut started were continued by his successor. In 1902 King Chulalongkorn (Rama V, 1868–1910) made the new sangha hierarchy formal and permanent through the Sangha Law of 1902, which remained the foundation of sangha administration in modern Thailand. Three major forces have influenced the development of Buddhism in Thailand. The most visible influence is that of the Theravada school of Buddhism, imported from Sri Lanka. While there are significant local and regional variations, the Theravada school provides most of the major themes of Thai Buddhism. By tradition, Pāli is the language of religion in Thailand. Scriptures are recorded in Pāli, using either the modern Thai script or the older Khom and Tham scripts. Pāli is also used in religious liturgy, despite the fact that most Thais understand very little of this ancient language. The Pāli Tipiṭaka is the primary religious text of Thailand, though many local texts have been composed in order to summarise the vast number of teachings found in the Tipiṭaka. The monastic code (Pātimokkha) followed by Thai monks is taken from the Pāli Theravada Canon. The second major influence on Thai Buddhism is Hindu beliefs received from Cambodia, particularly during the Sukhothai Kingdom. Hinduism played a strong role in the early Thai institution of kingship, just as it did in Cambodia, and exerted influence in the creation of laws and order for Thai society as well as Thai religion. Certain rituals practiced in modern Thailand, either by monks or by Hindu ritual specialists, are either explicitly identified as Hindu in origin, or are easily seen to be derived from Hindu practices. While the visibility of Hinduism in Thai society has been diminished substantially during the Chakri Dynasty, Hindu influences, particularly shrines to the god Brahma, continue to be seen in and around Buddhist institutions and ceremonies. Folk religion—attempts to propitiate and attract the favor of local spirits known as phi—forms the third major influence on Thai Buddhism. While Western observers (as well as Western-educated Thais) have often drawn a clear line between Thai Buddhism and folk religious practices, this distinction is rarely observed in more rural locales. Spiritual power derived from the observance of Buddhist precepts and rituals is employed in attempting to appease local nature spirits. Many restrictions observed by rural Buddhist monks are derived not from the orthodox Vinaya, but from taboos derived from the practice of folk magic. Astrology, numerology, and the creation of talismans and charms also play a prominent role in Buddhism as practiced by the average Thai—practices that are censured by the Buddha in Buddhist texts (see Digha Nikaya 2, ff). Additionally, more minor influences can be observed stemming from contact with Mahayana Buddhism. Early Buddhism in Thailand is thought to have been derived from an unknown Mahayana tradition. While Mahayana Buddhism was gradually eclipsed in Thailand, certain features of Thai Buddhism—such as the appearance of the bodhisattva Lokeśvara in some Thai religious architecture, and the belief that the king of Thailand is a bodhisattva himself—reveal the influence of Mahayana concepts. The only other bodhisattva prominent in Thai religion is Maitreya, often depicted in Budai form, and often confused with Phra Sangkajai (Thai: พระสังกัจจายน์), a similar but different figure in Thai Buddhist folklore. Images of one or both can be found in many Thai Buddhist temples, and on amulets as well. Thai may pray to be reborn during the time of Maitreya, or dedicate merit from worship activities to that end. In modern times, additional Mahayana influence has stemmed from the presence of Overseas Chinese in Thai society. While some Chinese have "converted" to Thai-style Theravada Buddhism, many others maintain their own separate temples in the East Asian Mahayana tradition. The growing popularity of Guanyin, a form of Avalokiteśvara, may be attributed to the Chinese presence in Thailand. While Thailand is currently a constitutional monarchy, it inherited a strong Southeast Asian tradition of Buddhist kingship that tied the legitimacy of the state to its protection and support for Buddhist institutions. This connection has been maintained into the modern era, with Buddhist institutions and clergy being granted special benefits by the government, as well as being subjected to a certain amount of government oversight. In addition to the ecclesiastic leadership of the sangha, a secular government ministry supervises Buddhist temples and monks. The legal status of Buddhist sects and reform movements has been an issue of contention in some cases, particularly in the case of Santi Asoke, which was legally forbidden from calling itself a Buddhist denomination, and in the case of the ordination of women attempting to revive the Theravada bhikkhuni lineage have been prosecuted for attempting to impersonate members of the clergy. To obtain a passport for travel abroad, a monk must have an official letter from Sangha Supreme Council granting the applicant permission to travel abroad; Buddhist monk identification card; a copy of House/Temple Registration; and submit any previous Thai Passport or a certified copy thereof. In addition to state support and recognition—-in the form of formal gifts to monasteries made by government officials and the royal family (for example, Kathin)—-a number of special rights are conferred upon Buddhist monks. They are granted free passage on public transportation, and most train stations and airports have special seating sections reserved for members of the clergy. Conversely, ordained monastics are forbidden from standing for office or voting in elections. In 2007, calls were made by some Thais for Buddhism to be recognized in the new national constitution as a state religion. This suggestion was initially rejected by the committee charged with drafting the new constitution. This move prompted a number of protests from supporters of the initiative, including a number of marches on the capital and a hunger strike by twelve Buddhist monks. Some critics of the plan, including scholar and social critic Sulak Sivaraksa, have claimed that the movement to declare Buddhism a national religion is motivated by political gain, and may be being manipulated by supporters of ousted Prime Minister Thaksin Sinawatra. The Constitution Drafting Committee later voted against the special status of Buddhism, provoking the religious groups. The groups condemned the Committee and the constitution draft. On August 11, Sirikit, the Queen of Thailand, expressed her concern over the issue. According to her birthday speech, Buddhism is beyond politics. Some Buddhist organizations announced a halt to the campaigns the next day. No law directly prohibits a member of the Buddhist institutions, such as a monk, a novice and a nun, from being a candidate in an examination for recruitment of government officers. Though both the Council of Ministers and the Sangha Supreme Council, the supervising body of the Thai Buddhist communities, have ordered such prohibition on grounds of appropriateness, according to the Memorandum of the Cabinet's Administrative Department No. NW98/2501 dated 27 June 1958 and the Order of the Sangha Supreme Council dated 17 March 1995. The members of the Buddhist community and the communities of other religions are not entitled to elect or be elected as a holder of any government post. For instance, the 2007 constitution of Thailand disfranchises "a Buddhist monk, a Buddhist novice, a priest or a clergy member" (Thai: "ภิกษุ สามเณร นักบวช หรือนักพรต"). The members of the Buddhist community are called samaṇa, one who is pacified, and also pabbajita, one who refrains from worldly activities. They are thus needed to carefully conduct themselves in a peaceful and unblamable manner, for their own sake and for the sake of their community. ... The seeking of the representatives of the citizens to form the House of Representatives is purely the business of the State and specifically the duty of the laity according to the laws. This is not the duty of the monks and novices who must be above the politics. They are therefore not entitled to elect or be elected. And, for this reason, any person who has been elected as a Representative will lose his membership immediately after becoming a Buddhist monk or novice. This indicates that the monkhood and noviceship are not appropriate for politics in every respect. When a monk or novice is involved in or supports an election of any person..., the monk or novice is deemed to have breached the unusual conduct of pabbajita and brought about disgrace to himself as well as his community and the Religion. Such a monk or novice would be condemned by the reasonable persons who are and are not the members of this Religion. A pabbajita is therefore expected to stay in impartiality and take a pity on every person...without discrimination. Moreover, the existence of both the monks and the Religion relies upon public respect. As a result, the monks and novices ought to behave in such a way that deserves respect of the general public, not merely a specific group of persons. A monk or novice who is seen by the public as having failed to uphold this rule would then be shunned, disrespected and condemned in various manners, as could be seen from many examples. A Buddhist monk reciting prayers in Thailand. During the latter half of the 20th century, most monks in Thailand began their careers by serving as temple boys (Thai: เด็กวัด dek wat, "children of the wat"). Temple boys are traditionally no younger than eight and do minor housework. The primary reason for becoming a temple boy is to gain a basic education, particularly in basic reading and writing and the memorization of the scriptures chanted on ritual occasions. Prior to the creation of state-run primary schools in Thailand, village temples served as the primary form of education for most Thai boys. Service in a temple as a temple boy was a necessary prerequisite for attaining any higher education, and was the only learning available to most Thai peasants. Since the creation of a government-run educational apparatus in Thailand, the number of children living as temple boys has declined significantly. However, many government-run schools continue to operate on the premise of the local village temple. Boys now typically ordain as a sāmaṇera or novitiate monks (Thai: สามเณร samanen, often shortened to nen Thai: เณร). In some localities, girls may become sāmaṇerī. Novices live according to the Ten Precepts but are not required to follow the full range of monastic rules found in the Pātimokkha. There are a few other significant differences between novices and bhikkhus. Novices often are in closer contact with their families, spending more time in the homes of their parents than monks. Novices do not participate in the recitation of the monastic code (and the confessions of violations) that take place on the uposatha days. Novices technically do not eat with the monks in their temple, but this typically only amounts to a gap in seating, rather than the separation observed between monks and the laity. Novices usual ordain during a break from secular schooling, but those intending on a religious life, may receive secular schooling at the wat. Young men typically do not live as a novice for longer than one or two years. At the age of 20, they become eligible to receive upasampada, the higher ordination that establishes them as a full bhikkhu. 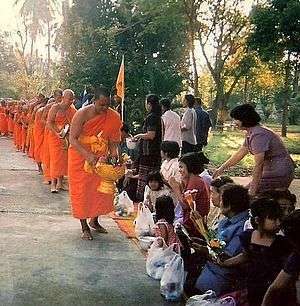 A novice is technically sponsored by his parents in his ordination, but in practice in rural villages the entire village participates by providing the robes, alms bowl, and other requisites that will be required by the monk in his monastic life. Temporary ordination is the norm among Thai Buddhists. Most young men traditionally ordain for the term of a single vassa or rainy season (Thai phansa). Those who remain monks beyond their first vassa typically remain monks for between one and three years, officiating at religious ceremonies in surrounding villages and possibly receiving further education in reading and writing (possibly including the Kham or Tai Tham alphabets traditionally used in recording religious texts). After this period of one to three years, most young monks return to lay life, going on to marry and begin a family. Young men in Thailand who have undergone ordination are seen as being more suitable partners for marriage; unordained men are euphemistically called 'unripe', while those who have been ordained are said to be 'ripe'. A period as a monk is a prerequisite for many positions of leadership within the village hierarchy. Most village elders or headmen were once monks, as were most traditional doctors, spirit priests, and some astrologists and fortune tellers. Monks who do not return to lay life typically specialize in either scholarship or meditation. Those who specialize in scholarship typically travel to regional education centers to begin further instruction in the Pāli language and the scriptures, and may then continue on to the major monastic universities located in Bangkok. The route of scholarship is also taken by monks who desire to rise in the ecclesiastic hierarchy, as promotions within the government-run system is contingent on passing examinations in Pāli and Dhamma studies. The Thai tradition supports laymen to go into a monastery, dress and act as monks, and study while there. The time line is based on threes, staying as a monk for three days, or three weeks, or three months or three years, or example of three weeks and three days. This retreat is expected of all male Thai, rich or poor, and often is scheduled after high school. Such retreat brings honor to the family and blessings (merit) to the young man. Thai make allowances for men who follow this practice, such as holding open a job. The Thai media often reports on Buddhist monks misbehaving. There have been reports of sexual assault, embezzlement, drug-taking, extravagant lifestyles, even murder. Thailand's 38,000 temples, populated by 300,000 monks, are easy targets for corruption, handling between US$3 to 3.6 billion yearly in donations, mostly untraceable cash. In a case that received much media attention, Luang Pu Nen Kham Chattiko was photographed in July 2013 wearing Ray-Ban sunglasses, holding a Louis Vuitton bag full of US dollars, and "...was later found to be a trafficker of methamphetamines, an abuser of women and the lover of a pregnant fourteen-year-old." In March 2016, Thai police formally summoned Acting Supreme Patriarch Somdet Chuang Varapunno, after he refused to answer direct questions about his vintage car, one of only 65 made. The car was part of a museum kept at Wat Paknam Bhasicharoen in Bangkok, but has now been seized by police investigating possible tax evasion. The Somdet reportedly transferred ownership of the vehicle to another monk after the scandal broke. He refused to answer police questions directly, insisting that written questions be sent to his lawyer. He did say that the car was a gift from a follower. Analysts from different news outlets have pointed out that the actions of the Thai government towards Wat Paknam Bhasicharoen may reflect a political need to control who should be selected as the next Supreme Patriarch, since the Somdet has already been proposed as a candidate by the Sangha Supreme Council. Selecting him would mean a Supreme Patriarch from the Maha Nikaya fraternity, rather than the Dhammayuttika fraternity, which historically has always been the preferred choice by the Thai government and the monarchy. As of April 2016, however, the proposal had not yet been processed by the Thai government. The Thai government cited several reasons for this, including the car. There have been cases when influential monks were persecuted and jailed by the Thai government, through verdicts later declared moot or subject of controversy. The most well-known case in Thailand is that of Phra Phimontham, the then abbot of Wat Mahadhatu, well-known in Thailand for having introduced the Burmese Satipatthana meditation method to Thailand. In 1962, during the Cold War, he was accused of collaboration with Communist rebels and being a threat to national security, and was fully defrocked and jailed. In fact, the government persecuted him because of his political views and promotion of changes in the Sangha. Phra Phimontham had a strong pro-democratic stance, which did not agree with the regime of that time, and the palace. Furthermore, Phra Phimontham was part of the Maha Nikaya fraternity, rather than the Dhammayuttika fraternity, which the government and monarchy historically have preferred. Phra Phimontham was likely to become the next Supreme Patriarch. For this reason, his treatment has been described by Thai scholars as a 'struggle between patriarchs' (Thai: ศึกสมเด็จ), referring to the political objective to disable him as a candidate. After four years, when the country changed its government, Phra Phimontham was released from prison when a military court decided he had not been involved in collaboration with communists after all. Afterwards, he ordained again and eventually regained his former status, though he continued to be discredited. Buddhadasa Bhikkhu was subject to similar allegations from the Thai government, and so was Luang Por Phothirak, the founder of Santi Asoke. Luang Por Pothirak was eventually charged of altering the Vinaya and defrocked. A recent example is Phra Prajak Kuttajitto, an environmentalist monk critical of government policies, who was arrested and defrocked. In February 2016, in a protest organized by the National Centre for the Protection of Thai Buddhism, a Red Shirt-oriented network, the example of Phra Phimontham was also cited as demands were made for the Thai government to no longer involve itself with the selection of the next leader of the Sangha. The Dhammayuttika Nikaya (Thai: ธรรมยุตนิกาย) began in 1833 as a reform movement led by Prince Mongkut, son of King Rama II of Siam. It remained a reform movement until passage of the Sangha Act of 1902, which formally recognized it as the lesser of Thailand's two Theravada denominations. Mongkut was a bhikkhu under the name of Vajirañāṇo for 27 years (1824–1851) before becoming King of Siam (1851–1868). In 1836 he became the first abbot of Wat Bowonniwet Vihara. After the then 20-year-old prince entered monastic life in 1824, he noticed what he saw as serious discrepancies between the rules given in the Pāli Canon and the actual practices of Thai bhikkhus and sought to upgrade monastic discipline to make it more orthodox. Mongkut also made an effort to remove all non-Buddhist, folk religious, and superstitious elements which over the years had become part of Thai Buddhism. Thammayut monks were expected to eat only one meal a day (not two) and the meal was to be gathered during a traditional alms round. The Thai Forest Tradition is a lineage which came out of the Dhammayuttika Nikaya around the turn of the 20th century, when Mun Bhuridatta and Ajahn Sao Kantasīlo left Thammayut circles in the cities in search of the noble attainments. The Dhammakaya Movement was founded in Thailand in the 1970s "as a fundamentalist extension of the Thai Buddhist nationalism fashioned in the 1920s and 1930s" and has been subject to controversy. In 1999 and again in 2002, leaders of the organization were accused of charges ranging from fraud and embezzlement to corruption. At that time, social critic Sulak Sivaraksa criticized the Dhammakaya Movement for promoting greed by emphasizing donations to the temple as a way to make merit. Widespread negative media coverage at this time was symptomatic of the movement being made the scapegoat for commercial malpractice in the Thai Buddhist temple community in the wake of the 1997 Asian financial crisis. The Sangha Supreme Council declared, however, that Wat Phra Dhammakaya had not broken any serious offenses against monastic discipline (Vinaya). In 2006, the Thai National Office for Buddhism cleared the Dhammakaya Foundation and Luang Por Dhammajayo of all accusations when Luang Por Dhammajayo agreed to return all the allegedly embezzled funds to the name of his temple. He was subsequently restored to the position of abbot of Wat Phra Dhammakaya. The Santi Asoke (Thai: สันติอโศก "Peaceful Asoka") or Chao Asok ("People of Asoka") was established by Phra Bodhirak after he "declared independence from the Ecclesiastical Council (Sangha) in 1975". Santi Asoke has been described as "a transformation of the "forest monk" revival of [the 1920s and 1930s]" and "is more radical [than the Dhammakaya Movement] in its criticism of Thai society and in the details of its own vision of what constitutes a truly religiomoral community." Although women in Thailand traditionally cannot ordain as bhikkhuni, they can choose to take part in quasi-monastic practices at temples and practice centers as maechi. Unlike in Burma and Sri Lanka, the bhikkhuni lineage of women monastics was never established in Thailand. Women primarily participate in religious life either as lay participants in collective merit-making rituals or by doing domestic work around temples. A small number of women choose to become maechi, non-ordained religious specialists who permanently observe either the Eight or Ten Precepts. Maechi do not receive the level of support given to bhikkhu and their position in Thai society is the subject of some discussion. Recently, there have been efforts to attempt to introduce a bhikkhuni lineage in Thailand as a step towards improving the position of women in Thai Buddhism. The main proponent of this movement has been Dhammananda Bhikkhuni. Unlike similar efforts in Sri Lanka, these efforts have been extremely controversial in Thailand. Women attempting to ordain have been accused of attempting to impersonate monks (a civil offense in Thailand), and their actions have been denounced by many members of the ecclesiastic hierarchy. In 1928 a secular law was passed in Thailand banning women's full ordination in Buddhism. Varanggana Vanavichayen became the first female monk to be ordained in Thailand in 2002. Some time after this the secular law was revoked. On 28 February 2003, Dhammananda Bhikkhuni received full monastic ordination as a bhikkhuni of the Theravada tradition in Sri Lanka, making her the first modern Thai woman to receive full ordination as a Theravada bhikkhuni. She is Abbess of Songdhammakalyani Monastery, the only temple in Thailand where there are bhikkhunis. It was founded by her mother, Voramai, a Mahayana bhikkhuni, in the 1960s. No one denies that men and women have an equal chance to attain enlightenment. In Mahayana Buddhism, practised in Taiwan, mainland China, Hong Kong and Tibet, female ordinations are common, but in countries that adhere to the Theravada branch of the religion, such as Sri Lanka, Thailand, and Myanmar, women were banned from becoming ordained about eight centuries ago, "for fear that women entering monastic life instead of bearing children would be a disruption of social order", according to Kittipong Narit, a Buddhist scholar at Bangkok's Thammasat University. Most objections to the reintroduction of a female monastic role hinge on the fact that the monastic rules require that both five ordained monks and five ordained bhikkhunis be present for any new bhikkhuni ordination. Without such a quorum, critics say that it is not possible to ordain any new Theravada bhikkhuni. The Thai hierarchy refuses to recognize ordinations in the Dharmaguptaka tradition (the only currently existing bhikkhuni ordination lineage) as valid Theravada ordinations, citing differences in philosophical teachings and (more critically) monastic discipline. Wikivoyage has a travel guide for Meditation in Thailand. ↑ 'Lamphun's Little-Known Animal Shrines' in: Forbes, Andrew, and Henley, David, Ancient Chiang Mai Volume 1. Chiang Mai ,Cognoscenti Books, 2012. ↑ "CIA World Factbook: Thailand". Central Intelligence Agency. 2007-02-08. Retrieved 2007-03-07. ↑ Gombrich, Richard F. (2006). Theravāda Buddhism : a social history from ancient Benares to modern Colombo (2nd ed.). London: Routledge. p. 3. ISBN 978-0415365093. 1 2 3 4 Tuchrello, William P. "The Society and Its Environment" (Religion: Historical Background section). Thailand: A Country Study. Federal Research Division, Library of Congress; Barbara Leitch LePoer, ed. This article incorporates text from this source, which is in the public domain. ↑ Charoensuthipan, Penchan. "Thai Buddhists call for top status 'unnecessary'". Retrieved 2007-04-18. 1 2 Monks push for Buddhism to be named Thailand’s religion Archived June 16, 2007, at the Wayback Machine. ↑ Osathanon, Prapasri; Nerisa Nerykhiew (2007-07-01). "Drafters reject Buddhism as state religion". The Nation. Archived from the original on 2007-09-29. Retrieved 2007-08-18. ↑ "Buddhist groups, monks halt campaigns against draft charter". The Nation. 2007-08-12. Archived from the original on 2007-09-29. Retrieved 2007-08-18. ↑ ประกาศสำนักงานสภาความมั่นคงแห่งชาติ ลงวันที่ 21 พฤศจิกายน 2556 [Announcement of the National Security Council Office dated 21 November 2013] (PDF) (in Thai). Bangkok: National Security Council. Dec 2013. Retrieved 2014-01-22. ↑ "Section 100 of the Constitution of the Kingdom of Thailand, Buddhist Era 2550 (2007)". Asian Legal Information Institute. 2007. Retrieved 2014-01-22. 1 2 3 Matichon (2007-06-16). หมายเหตุคำสั่งมหาเถรสมาคม พ.ศ. 2538 [A statement of grounds attached to the 1995 Order of the Sangha Supreme Council] (in Thai). Sanook!. Archived from the original on February 2, 2014. Retrieved 2014-01-22. ↑ Fifield, Anna (2015-05-15). "Hardliner tries to reform Thailand's Buddhist monks behaving badly". Washington Post. Retrieved 16 May 2015 – via The Guardian. 1 2 "Thai TV anchor turned monk fights for women's right to be ordained". South China Morning Post. 2015-05-10. Retrieved 21 May 2015. ↑ Cochrane, Liam (2016-03-29). "Thailand's head monk to be summoned by police over luxury Mercedes-Benz". Australian Broadcasting Corporation. Sydney. Retrieved 30 March 2016. 1 2 McCargo 2012, p. 638. ↑ Tanakasempipat, Patpicha; Kittisilpa, Juarawee; Thepgumpanat, Panarat (2016-04-22). Lefevre, Amy Sawitta, ed. "Devotees at Thai temple give alms to tens of thousands of Buddhist monks". Reuters. Retrieved 2016-08-20. ↑ "Men-at-alms". 2016-04-02. Retrieved 2016-08-20. 1 2 3 Scott 2009, p. 39–41. ↑ Fuengfusakul, Apinya (1998). ศาสนาทัศน์ของชุมชนเมืองสมัยใหม่: ศึกษากรณีวัดพระธรรมกาย [Religious Propensity of Urban Communities: A Case Study of Phra Dhammakaya Temple] (in Thai). Buddhist Studies Center, Chulalongkorn University. pp. 101–2. ↑ Newell, Catherine Sarah (2008-04-01). Monks, meditation and missing links: continuity, "orthodoxy" and the vijja dhammakaya in Thai Buddhism (PhD diss.). London: Department of the Study of Religions School of Oriental and African Studies, University of London. ↑ พระพิมลฯผจญมารคดีประวัติศาสตร์วงการสงฆ์ [Phra Phimontham confronts the devil: A historical case in the world of the Sangha]. Kom Chad Luek. Thailand: The Nation Group. 2009-12-11. Retrieved 20 August 2016. ↑ Wongcha-um, Panu (5 February 2016). "Thai monks protest against state interference in Buddhist governance". Channel News Asia. Mediacorp Pte Ltd. Retrieved 2016-08-28. ↑ "The Customs of the Noble Ones", by Thanissaro Bhikkhu. Access to Insight (Legacy Edition), 7 June 2010, http://www.accesstoinsight.org/lib/authors/thanissaro/customs.html . 1 2 Marty, Martin E.; Appleby, R. Scott, eds. (1994). Fundamentalisms observed (Pbk. ed., 2. [Dr.]. ed.). Chicago: University of Chicago Press. p. 668. ISBN 978-0226508788. ↑ Udomsi, Sawaeng (2000). "รายงานการพิจารณาดำเนินการ กรณีวัดพระธรรมกาย ตามมติมหาเถรสมาคม ครั้งที่ ๓๒/๒๕๔๑" [Report of Evaluation of the Treatment of the Case Wat Phra Dhammakaya -- Verdict of the Supreme Sangha Council 32/2541 B.E.]. วิเคราะห์นิคหกรรม ธรรมกาย [Analysis of Disciplinary Transactions of Dhammakaya] (in Thai). Bangkok. pp. 81–85. ISBN 974-7078-11-2. ↑ "Thailand | Thai court spares founder of Dhammakaya". Buddhist Channel. 2006-08-23. Retrieved 2016-05-01. ↑ Sanitsuda Ekachai. "The Man behind Santi Asoke". Archived from the original on 12 July 2012. Retrieved July 13, 2010. 1 2 Willis, Jan (2013-01-21). "Building a Place for the Theris". Lion's Roar. Retrieved 21 Apr 2015. ↑ Kurz, Sopaporn (2007-07-22). "Bhikkhuni says she is glum on future of ordination". The Nation. The Buddhist Channel. Retrieved 21 Apr 2015. ↑ Sommer, PhD, Jeanne Matthew. "Socially Engaged Buddhism in Thailand: Ordination of Thai Women Monks". Warren Wilson College. Retrieved 6 December 2011. ↑ Kristin Barendsen. "Ordained at Last". Archived from the original on February 6, 2004. Retrieved May 17, 2008. ↑ archive.org: "Ordained at Last by Kristin Barendson". Archived from the original on 2004-02-06. Retrieved 2010-11-19. ↑ David N. Snyder, Ph.D. "Who's Who in Buddhism". Retrieved May 17, 2008. Buswell, Robert E., ed. (2004). "Thailand", in Encyclopedia of Buddhism. Macmillan Reference USA. p. 830-836. ISBN 0-02-865718-7. Jerryson, Michael K. (2012). Buddhist Fury: Religion and Violence in Southern Thailand. Oxford University Press. ISBN 978-0-19-979329-7. Kabilsingh, Chatsumarn (1991). Thai Women in Buddhism. Parallax Press. ISBN 0-938077-84-8. Tambiah, Stanley (1970). Buddhism and the Spirit Cults in North-East Thailand. Cambridge University Press. ISBN 0-521-09958-7. Terwiel, B.J. (May 1976). "A Model for the Study of Thai Buddhism". Journal of Asian Studies. 35 (3): 391–403. doi:10.2307/2053271. JSTOR 2053271. Na-rangsi, Sunthorn (2002). "Administration of the Thai Sangha" (PDF). The Chulalongkorn Journal of Buddhist Studies. 1 (2): 59–74. Archived from the original (PDF) on February 27, 2012.